Black Friday and Cyber Monday Buy 2 get 1 Free Special! With Media Elements LLC you will find professional level aerial video footage services. We utilize the most advanced technologies in the industry to get you amazing video footage from a vantage point that was not previously possible. We also use professional talent to make sure your footage looks great. Low level (5 to 300 feet, possibly higher if air space is cleared) aerial vantage points that can be used in Marketing Videos, News Media, Movies, and more. We provide full service production and/or just raw footage services that can be used for anything you feel you need. We now provide professional aerial photography & video production services creating highly specialized close range aerial media for creative clients in the United States and around the world. San Francisco based we fly only remote controlled aircraft known as a Multicopter, light weight and all battery powered they fly like a helicopter with vertical flight, quiet, with four electric motors for aerial photography and video. This flying platform is for a new type of creative aerial media that is cutting edge and catching on fast. Perspective is everything! The perspective it offers will captivate and amaze! Cost comparison to a manned helicopter is off the chart! Our Multicopter can replace a camera Jib on a Movie or TV set, get that impossible shot for a car commercial, or we can replace the manned helicopter on a photo shoot. Our Multicopters are like flying platforms for almost any aerial task. We can provide different Multicopters for different tasks and payloads. We also specialize in future elevation photography for buildings yet to be built showing the future views in full 360 Panoramic interactive views! The sky is the limit! With precise GPS control, and gyro stabilized camera mounts the camera can now fly up close and personal revealing that “impossible” point of view and more! Our services start as low as $3000+ per day of video shooting but we work on a per project basis with this service and it depends on your requirements. Set to “Loiter” mode to hold position and altitude for steady video in one spot. Set to “Hold Altitude” mode to hold a specific altitude while just controlling the movement/location of the Flying Platform. Rotation – Pick a specific spot on a GPS location and set a radius and altitude. Then be able to rotate around that specific object to capture some great footage. Follow – With the telemetry technology we can place a laptop in a vehicle and the Flying Platform will follow the vehicles movements. Waypoints (50 max) – Set waypoints for flying a specific flight pattern before returning to launch spot. Media Elements LLC uses a hex-rotor aircraft developed for aerial videography and photography and possibly for search and rescue. Rapid deployment is redefined. From “in the box” to “in the air” is less than 5 minutes! All electronics, motors and propellers are fully integrated into the molded composite arms; swapping out an entire arm assembly (including Arm, ESC, Motor, and Propeller) can be done without tools in a matter of seconds. With the help of the autopilot system, large-radius turns, precise hovering, and maintaining constant airspeed has never been easier! The links below were created with this exact video platform. Take a look at how the footage is smooth and professional and low flying without wind disturbing the area around the scene like a helicopter would. S800 is a professional Hex-Rotor Platform Big Aircraft, designed for commercial aerial photography (AP). It has the advantage of stable flight, large load weight and long flight time. Combined with multi-rotor autopilot system, S800 can easily perform precise hovering, constant-speed cruise and big maneuverability turning. Flight time is about 15 – 20 minutes per flight depending on payload. If payload is very light the flight time could be as high as 30 minutes. Gone are the days of shaky, unstable video footage! Weather you are shooting a movie or commercial, or performing a search and rescue mission, shaky footage is the number one problem plaguing the aerial photography industry. After all, what good is a view from the sky if it’s unusable? 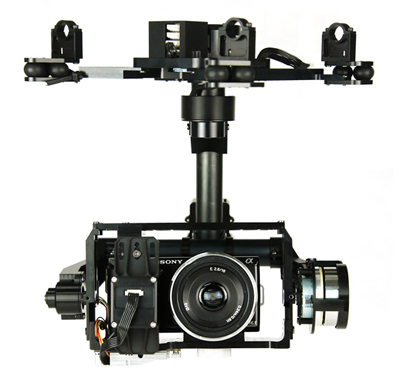 Through the use of 3-axis gyros, inertial measurement unit feedback, and special Direct Drive modules, the Zenmuse line of camera gimbals achieve sub-pixel stabilization. This performance was previously only achieved in the most expensive full-scale helicopter gimbals; most of which cost upwards of $500,000. Now, for less than 1% of the cost, you can achieve perfectly stable footage every flight… even in windy conditions!